I have had this nagging in the bag of my head telling me that I want a drum carder. I have looked into it a few times but never bought one. I want one primarily for blending merino wools with fine fibers. It should be able to handle the slightly coarser wools that I like – Romney and wensleydale for instance. And it should be able to handle the occasional fleece. Ultimately I would like to be able to make blends with soy silk and camel down and other finer fibers. I think the one that might be right for me is a Strauch Petite. I like the petite-ness (studio apartment) and the fine cloth. The only complaints that I was that when processing fleeces on the fine cloth, the second cuts didn’t get separated but that seems preferable to not being able to card fine fibers. And I shouldn’t forget to mention that the comparatively low price is a major factor. Here’s where you come in… What do you think? Do you know anything about carders or own one that you have an opinion about? Leave me a comment and let me know! You will be eligible to win a prize from me if you do. Don’t worry if you don’t know anything about drum carders, you can still be eligible to win a prize. Just leave me a comment and tell me about your favorite knitting/ crafting material or tool. For instance, you might tell me that you you couldn’t survive without medium-weight Socks that Rock. Or that your Bernina is your most dear possession. Or that you cannot resist alpaca yarn. I want to hear about what you like! The contest will be open until next Saturday, June 9th when the winner will be selected at random. I’ll send you some sock yarn, and a sock knitter’s needle case. If a non-knitter ends up as the winner, and doesn’t want the prize we’ll figure something out. Want to see the prizes? The red yarn was dyed by me, but never made it into my etsy shop. I dubbed it “unphotographable red” and had to screw with the photo in photoshop to get it to look kinda normal. 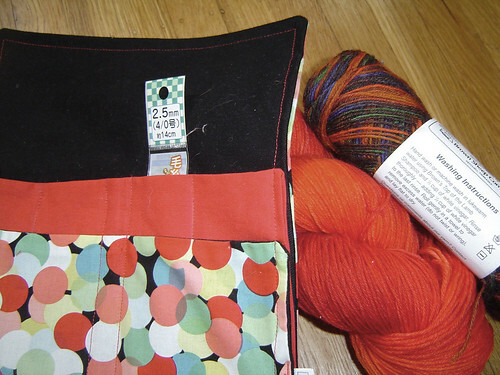 The colors go from a red-orange to a medium red and it si a superwash wool nylon blend. The Needle case was hand sewn by me in the style of the ones in my shop. Perfect for circulars, DPN’s and crochet hooks. I threw in a little crochet hook that I got at Daiso – you’ll get that too. Finally I added two skeins of Brown Sheep Handpainted yarn. Nice traditional wooly sock yarn. So get commenting! 76 Responses to "What’s Your favorite: a contest"
I know absolutely nothing about drum carders! My latest knitting want? Sock blockers! hmm, it cut my reply off… my “tool” is my knit/spin group and my mom (who’s knit for 40+ yrs.) without them I wouldn’t be a knitter or a spinner! Wow…what a question….you’re making my brain hurt…. I would have to say my fishy stitch markers I made. They are currently being used in a lace project and when I get frustrated, my little fishies make it all better! If we ever do Sheep to Shawl again (hahahahahahaa! ), I totally want to see if we can sneak in a drum carder like the kiddie class head because it was niiice but I do like hand carders we used. Definately the umbrella swift and ball winder are my favority knitting tools. All I know about drum carders is that they are expensive and that one size doesn\\\’t card all fibers. As a result this is an item for a die-hard fiber processor. Good luck. I have to say my very favorite item for knitting is my many, many, bags. They are a great way to keep yarn away from the cats, keep the wife guessing how much yarn I have and projects together. Good luck deciding on a drum carder. I couldn\’t survive knitting without the internet! A great resource for patterns, instructions, and fellow knitters! I love my extra long addi turbo circulars for Magic Loop sock knitting! This is dumb because it has so little to do with the knitting process, but I have to have those little plastic sheets to shove my patterns into! And I do love my sheep needle gauge. I started spinning in November 2006 and I couldn’t live without my ball winder, swift, and niddy noddies. I would eventually like to get a skein winder but that will have to wait. I have started using a hand carder but I imagine a drum carder will be something I will have to decide on at some point in the future. Great question! I\’ve been reading up on carders too and I\’m thinking of getting a Strauch Petite in the fall. Can\’t justify the purchase until then, but I\’ve heard very good things about them. I can’t live without my Chibi! It’s just the best little needle carrier, and it makes such a jolly sound rattling around in my knitting bag. OK, I need to get out more. Plus, I really love kitchener stitch, and Chibi needles are essential for that. I don\’t spin (yet)…..but for now….my must have knitting item are all my tote bags and baskets to stash my various WIP!! hmm…tie between my ball winder and my chibi. i love my little chibi! The only drum carded that I\’ve ever used is a very very old one that belonged to a friend of mine. I leared from her that an older reliable drum carder is much like your grandmother\’s favorite pair of bamboo knitting needles. It doesn\’t so much matter how old it is as long as you care for it properly. From this I would say it\’s almost good to buy an older model on ebay or something, they can all handle a beating but need to be oiled regularly and never over stuffed though you can put them to the test. You should have no problem finding something for what you\’re wanting to do. And as for after you get one, your greates advisary will be a dog brush and an old knitting needle that you don\’t use (aluminum is best) to help you work of the carded wool. Good luck! I have no personal opinion on carders, but I’m told that Patrick Greens are very very good. My favorite toy is the niddy noddy/swift/ballwinder trifecta! I only wish I were ready for the big-time! I don\’t even have hand-carders. Of course, I just started spinning on a spindle, so I suppose first things first. Right now my favorite knitting tool is my Addi Turbos – I taught myself magic loop because I was breaking my bamboo DPNs, and I\’m sure I\’d lose stiches on metal ones. I want to try Knitpicks circular needles, but I\’m not sure about the whole exchangeable cable thing. It\’s too bad that no one reads your blog. Holy crap – could you have more comments? Faves…swift…winder…needles…yep, and stitch markers. The Clover safety pin types are awesome. Handmade ones are lovely too, but the mint green/salmon ones from Clover are devine. Oh, and I really like those curly plastic things from Clover for holding needles together. I can\’t say that this is my *favorite* accessory, but the one I always have with me/is used the most: Dental floss. In a plane and need to cut the yarn? Small metal slicer. Lifeline necessary and no mercerized cotton handy? Dental floss. Emergency stitch marker? Dental floss. Spinach in your… oh, never mind. I think you get it. I\’ve got mixed feelings about drum carders, which have nothing to do with the fact that I\’m still saving for one (ahem). On the plus side, they are wonderful tools for blending different fibers/colors, and they make relatively short work of a big fleece. On the minus side, contrary to popular opinion they aren\’t any faster than hand cards due to the amount of prep time needed for the fibers (so that you can be kind to your Big Financial Investment). My favorite toy is my Bosworth Mini spindle. Pretty, easy spinner – I just love it. I\’m going to go with my row/round-counting stitch markers. You even inspired me to write a post all about them! As strange as this may sound, the Salvation Army thrift shop is one of my favourite knitting things. Being on a pretty tight budget, I can’t afford much yarn, but I’ve found sweaters in cashmere, silk, linen, merino, even camel for not more than a couple dollars apiece. Unravel (ok, that’s a lot of work), maybe re-dye, and voila, luxury yarns to knit with.